I decided to purchase $5000 worth of Santos shares under the SPP that closes next week (31 Jan). The issue price will be around $4.00. As I also have some long crude oil CFDs, I'm obviously punting on the oil price going back up a bit in future. My current holding of Santos shares is around $15,000 market value, so this will increase my investment in Santos by around 1/3. While the oil price has fluctuated wildly over the past 30 years (from below $20 to over $140! 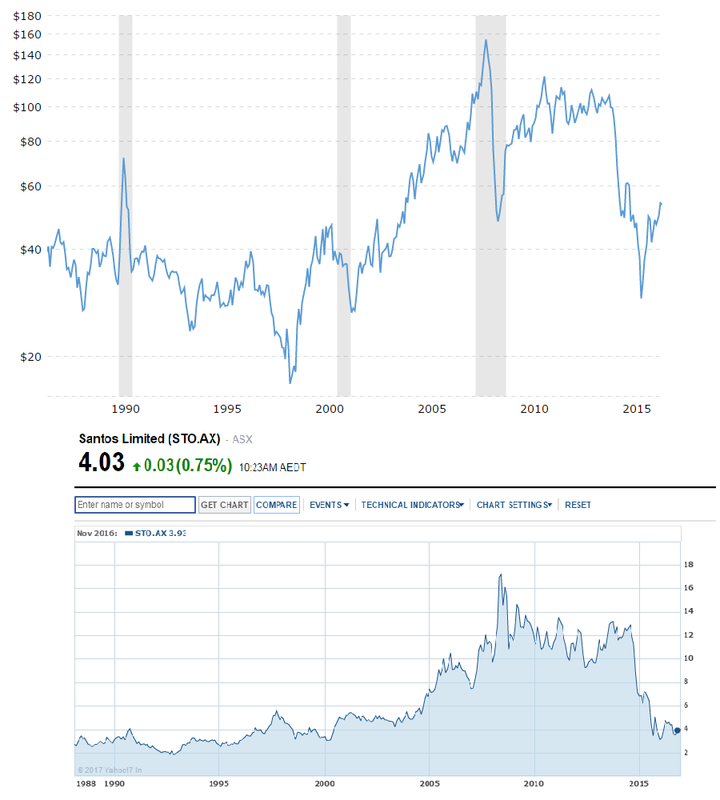 ), there seems to be some support around the $40 mark, which corresponds roughly to a Santos share price around $4.00. So, overall, it seems that the downside risk is for the share price drop to as low as $2 (or the company to go broke in a period of prolonged low oil prices), whereas a continuation in the current rise in oil prices (if there is stronger global growth in future) could see oil hit $60-$80 again, and the Santos stock price rise to $6-$8 again. While this share purchase is a bit of a gamble, as the amount only represents about 1% of my geared stock portfolio, and 1/4% of my net worth, so either outcome won't have a big impact on my net worth. 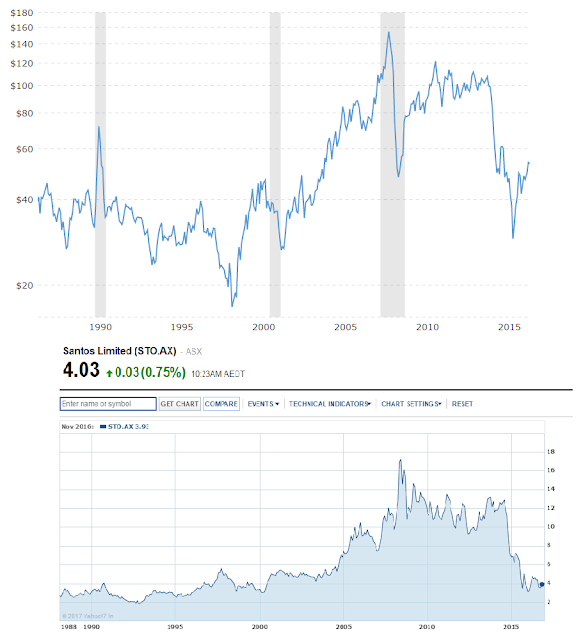 The top chart below shows the crude oil price (http://www.macrotrends.net/1369/crude-oil-price-history-chart) over the past 30 years, and the bottom chart is the Santos stock price since 1988.